For a variety of reasons, I cannot get out this week to photograph, so I will contrive a virtual trip that could have been. This is the week I should be going back to one of my favorite places, the Navy and Merchant Marine Memorial. 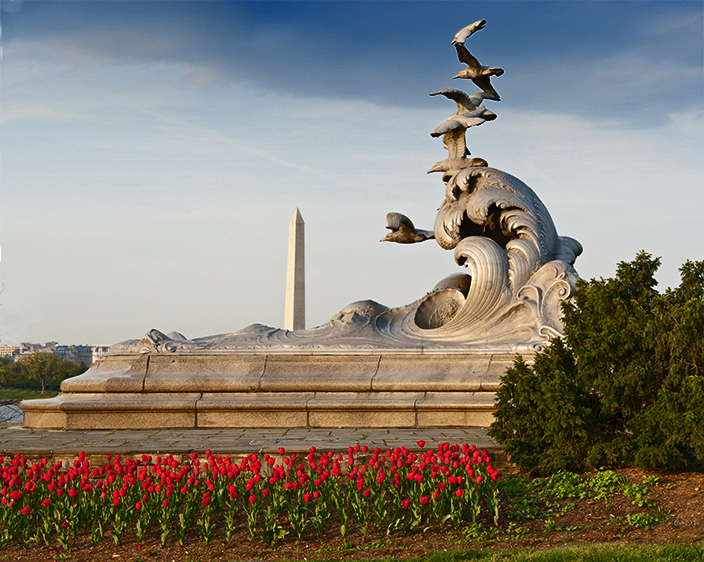 The memorial is an elegant sculpture cast in aluminum and located on the Virginia side of the Potomac just north of the 14th Street Bridge. It’s another one of those hidden gems, despite the fact that it is less than 100 feet away and in plain sight of thousands of commuters driving by each day. So go outside tomorrow and enjoy the day, no matter where you are on the planet. The Cherry Blossoms are gone, the lunar eclipse was hidden by clouds this morning and it’s been raining all day. So what better way to keep on the move than to make a scouting run into the city? It’s that time of year when the fountains scattered around the Washington National Mall are being turned on. Three weeks ago, only the World War II Memorial was operating. But now many of them are running; of the nine that I checked, seven are happily pumping out the spray. News Flash: We interrupt this post to announce that one of my images was selected for “Monochrome Madness,” an event produced by Australian photographer Leanne Cole, a professional photographer in Melbourne whose blog has over 23,000 followers. You can see her post with the 44 selected images here. 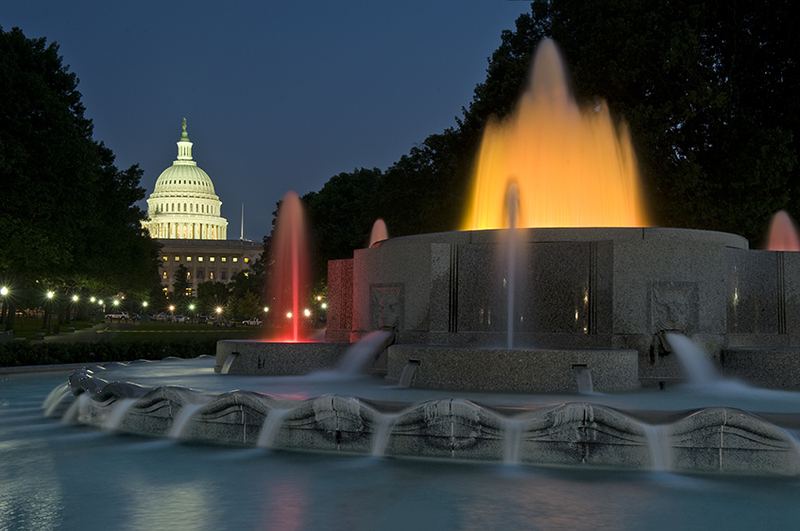 Now back to our regularly scheduled post on Washington, DC fountains. Navy Memorial (Pennsylvania Avenue between 8th and 9th Street NW): This is one of the better fountains in the city, and can’t be easier to photograph. You are steps away from a Metro entrance, benches are plentiful, and an excellent French boulangerie (Paul Bakery) is on the west side of the plaza. Supreme Court (1st Street NW, across from the Capitol Building): The two small fountains on the north and south sides of the front plaza are now running. While not very impressive, any photo that includes the basins looks much better now than when they are empty. Court of Neptune Fountain (1st Street SW, across from the Capitol Building): New York sculptor Roland Hinton Perry was only 27 years old when he completed the fountain in 1898, when the Jefferson Building of the Library of Congress was opened. This is not your average fountain and the physicality of the scene is quite dramatic when the water is running. The nearby Capitol South Metro Station is a short walk of two blocks. 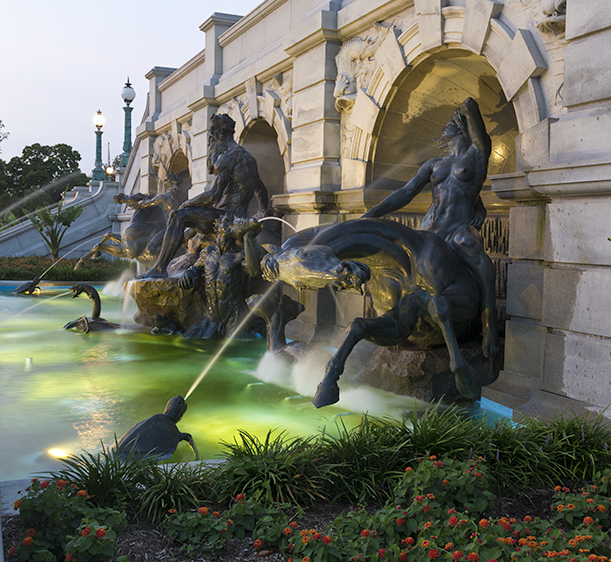 Senate Fountain (opposite the intersection of Louisiana Avenue NW and North Capitol Street NW): This is one of the few (perhaps only) fountains in the city with a variable color lighting system). Boasting a view of the Senate side of the US Capitol, it provides a number of photo opportunities in the evening light. The Union Station Metro stop is within easy walking distance. Japanese American Patriotism Memorial: (Directly opposite the Senate Fountain in a small triangular park between Louisiana Avenue, New Jersey Avenue, and D Street NW): Technically this is not a fountain, but a flowing pool which is the principal feature of the park. Dedicated only ten years ago, it recognizes the mistake made by the US in the forcible placement of more than 110,000 Japanese Americans into ten internment camps. 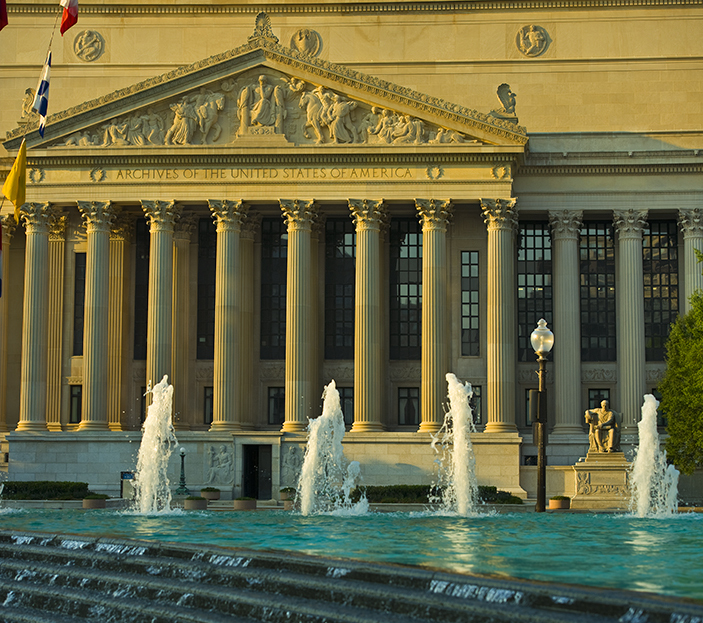 National Museum of the American Indian (Intersection of Maryland Avenue and Independence Avenue SW ): The fountain is located on the northwest corner of the museum with the water cascading over large boulders and flowing along a channel on the north side of the building. The Federal Center Metro Station is about 3 blocks to the south. 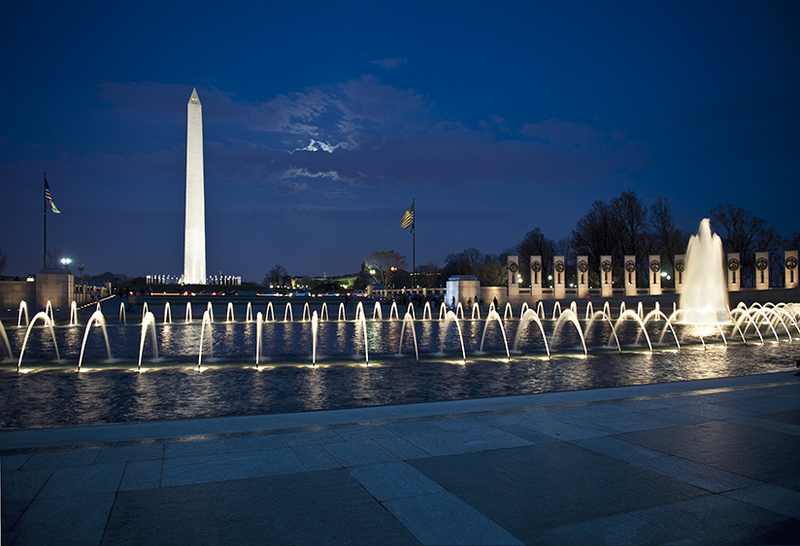 World War II Memorial (17th Street between Constitution Avenue and Independence Avenue): The fountains are now running although they are turned off sometime during the night and resume operating just before dawn. However, the repair project at the west end of the Memorial is still unfinished. As a result, the two waterfalls on either side of Freedom Wall are still dry. Even so, this memorial offers more photo opportunities than any of the others on this list. No nearby Metro Station. Banneker Fountain (South end of the L’Enfant Plaza on 10th Street SW): Probably the least well known site on this list, the 30-foot tall column of water (when operating) is the central feature of the Benjamin Banneker Park. Banneker was an African American who had a role in the original surveys that eventually resulted in the layout of the city of Washington. However, the historical evidence is unclear on the specific details. The small park, designed by landscape architect Dan Kiley was constructed in 1967. Kiley is currently being featured in a major retrospective of his work at the National Building Museum. The L’Enfant Plaza Metro Station is about 5 blocks to the northeast. Bartholdi Fountain (Across Independence Avenue SW from the US Botanical Garden): This fountain is the central feature of a small park maintained by the US Botanical Garden, It was designed by Frederic Auguste Bartholdi who is better known as the creator of the Statue of Liberty. I will write a separate post on this fountain when the water is turned on. It was all too brief. They were late to arrive, then came in with a rush, delighted us for just a few days, and now they are leaving. 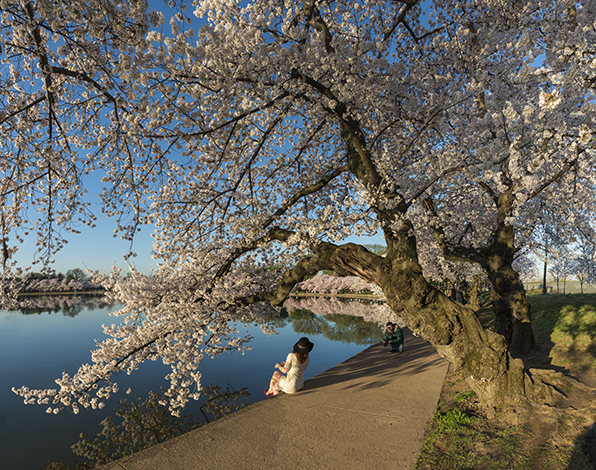 For those of us who want to photograph them, it seems harder each year as more and more people descend upon this little landscape of pink trees framed by blue water and skies with constantly changing hues. I guess it started on March 29th when the first hints appeared. An early morning fog blanketed the scene with an air of mystery, the almost invisible shade of pink suggestive of what might be in store. The nearly deserted sidewalks suggested that only a privileged few knew of this place. For more than a week, the tease continued. But by the morning of April 8th, the buds were beginning to open. From a distance, the trees glowed with that distinctive pink while up close you could anticipate something better was yet to come. But suddenly, the accelerator was pushed to the floor and in the next 24 hours, the blossoms swelled considerably. Yet the number of people was still manageable. There was no real problem finding a place to set up. But warning bells of experience from past years were sounding in my brain. 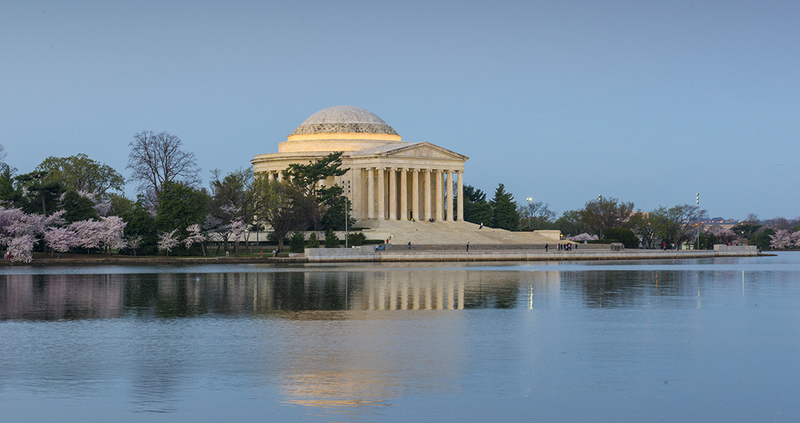 On Thursday April 10th, the floodgates opened and, as if on signal, a human tsunami rolled into the Tidal Basin. For a brilliant description of the crowds from the perspective of a photographer, you can’t do better than the post by Mitch Zeissler. People wandering through the scene are a fact of life for DC photographers and adaptation is the only alternative to surrender. One approach is combining patience with anticipation. 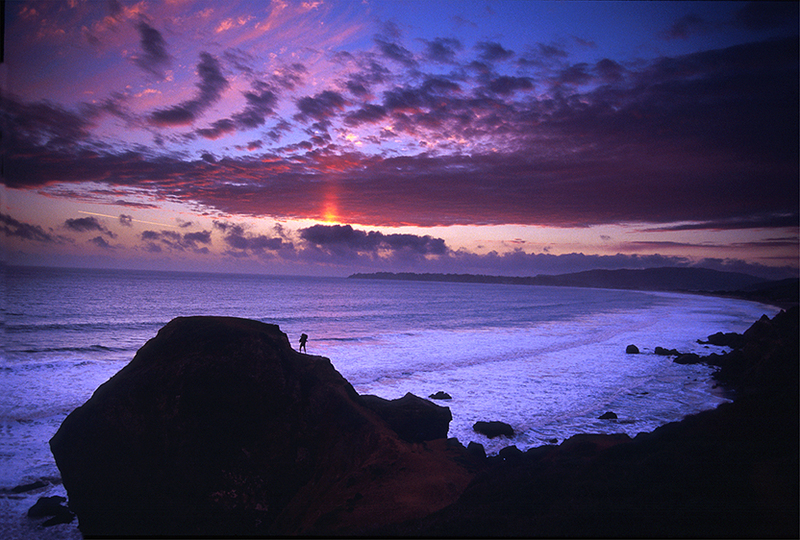 This image below is a merge of 4 separate shots, the first three taken from the extreme left to the middle right. Then I waited until there was a brief moment when the sidewalk in the foreground was relatively clear and took the fourth image. It was a beautiful day and about as perfect as it gets here so the long walk back to the car was quite special, if you don’t mind sharing the moment with 50,000 people. But signs of the end were clearly visible. 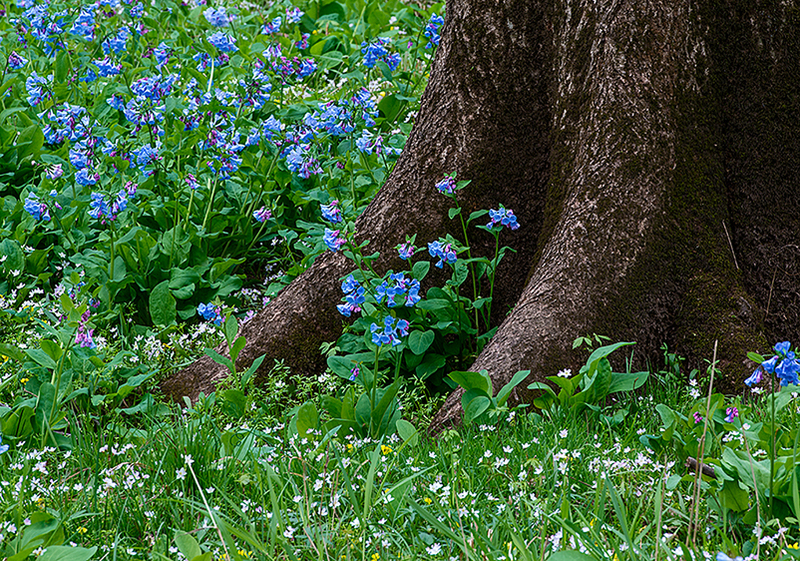 The occasional small flecks of tiny pink petals floating down from the trees told the tale. The blossoms had peaked and the downward decline had begun. The cycle was moving onward and a year from now we’ll be back here again. I can hardly wait. This city has any number of spots that are well known and heavily trafficked by locals and tourists alike. But there are also lesser known places that have a charm of their own, largely because they are not surrounded by idling tour buses and hordes of people snapping pictures. 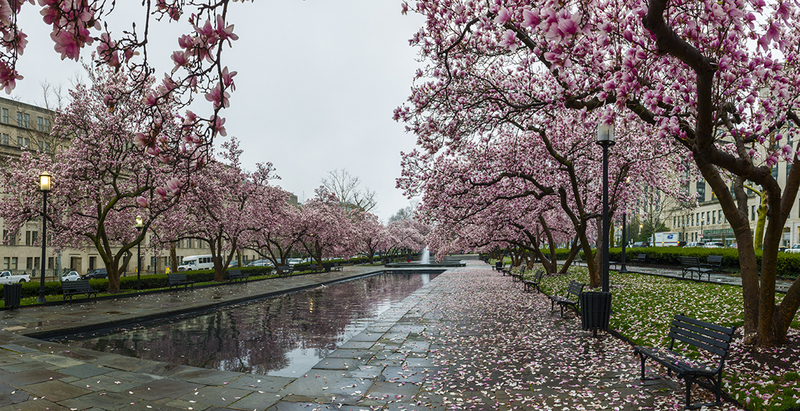 Rawlins Park, in Foggy Bottom, is just such a place. And as you will see from these photos, this is the best week of the year week to go there. 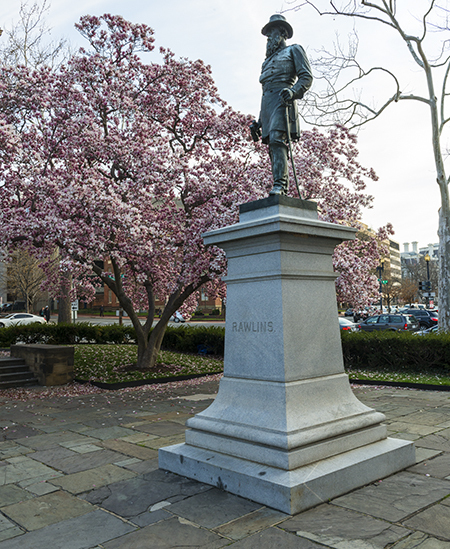 The park is named for Major General John A. Rawlins, an officer in the Union Army who served as an aide to General Ulysses S. Grant. Rawlins joined Grant’s staff in 1861 as a lieutenant and stayed with him through the entire Civil War. 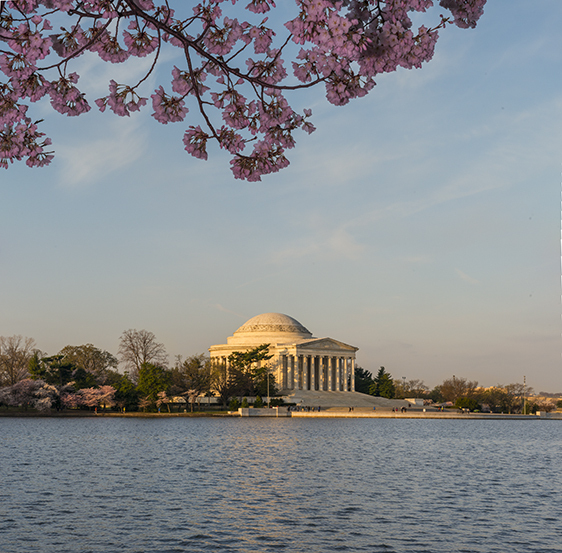 According to James M. Goode, in his comprehensive tome “Washington Sculpture,” the park was an oasis in a neighborhood of small Victorian townhomes until the 1950s when the historic homes were replaced by large office buildings. One lone survivor remains, the Octagon House located across the street at the corner of 18th and E Street NW. But the park itself did survive, and despite its location between two multi-lane thoroughfares carrying thousands of cars each day to and from Virginia, it is still a charming oasis. It is lined on both sides with what I call tulip trees but what people (and there are many) who have more plant knowledge would call a hybrid magnolia. Two reflecting pools and a small central fountain complete the effect. And this is the week that those tulip trees are showing off. 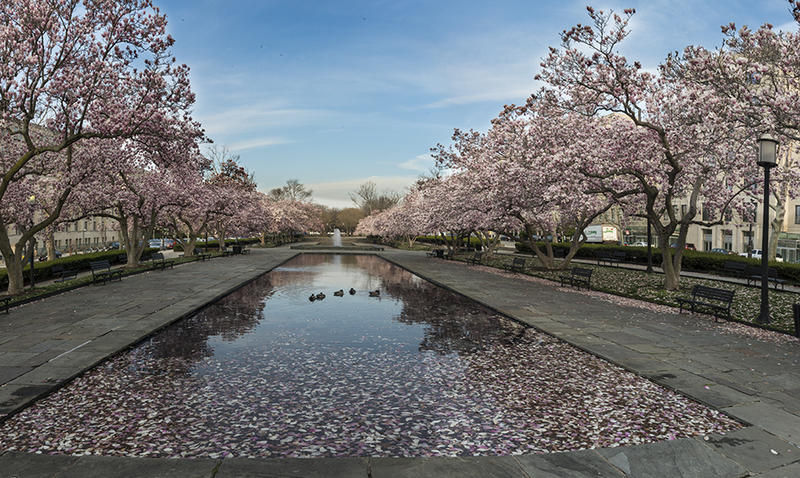 The pavement and reflecting pools are covered with the dropping petals from the large, tulip-shaped blooms and a few ducks practice take-offs and landings from time to time. There are plenty of benches under the trees and if the gaudy display doesn’t jolt your senses, there is a handy Starbucks across the street at the corner of 20th and E Street NW.